Free USA S&H. 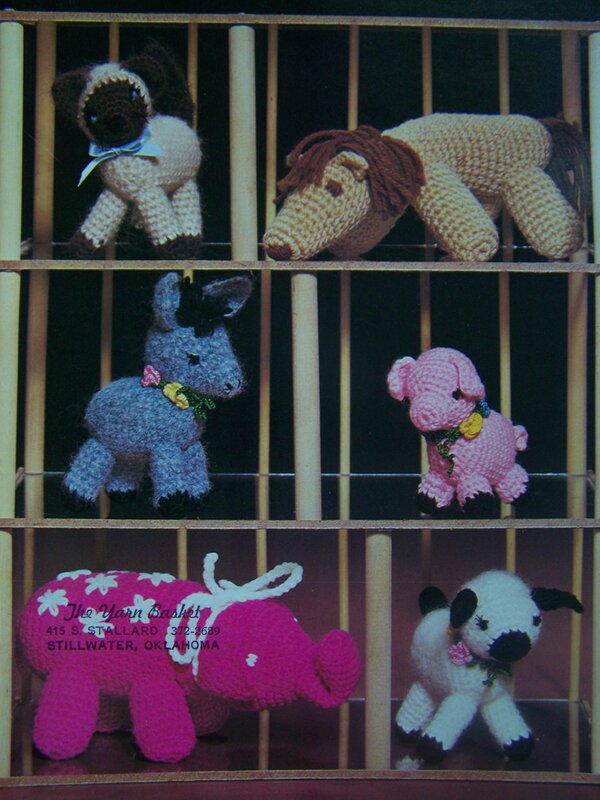 Six 1977 Vintage stuffed animal crochet patterns; Donkey, pink pig, lamb, siamese kitten, elephant, brown horse, flower garden to make collars for your animals. More new, vintage crocheting and knitting patterns listed. Inventory box 50. Condition: Slight shelf and storage wear. Measurements: Donkey 7" tall, pink pig 5" tall, lamb 6" tall, flower garden 3/4" diameter, siamese kitten 6" tall, rose elephant 12" long x 5.5" tall, brown horse 10.5 long x 5" tall. S & H to the USA is F R E E first class and only $1.00 for each additional pattern. S & H to Canada please ask for your shipping cost..